The standard cam sprockets on the K series come with alignment markings and specific dowel positions for the inlet and exhaust cams which allow error free assembly and initial cam timing. Vernier timing wheels such as those supplied by Piper are not 'handed' in this respect, both verniers are identical and they do not have alignment markings. This can make the initial timing of the cams when first fitting verniers a bit of a problem. Before removing the old sprockets it is wise to turn the engine to 90 BTDC until the timing marks line up as per the picture below. 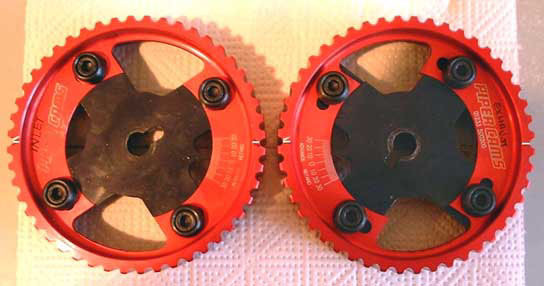 A foolproof way of ensuring that the cams are initially correctly timed with the verniers is to transfer the timing marks from the old cam sprockets to the verniers in the correct position. The first step is to designate one of the vernier pulleys as an inlet and the other as an exhaust and then mark the pulleys accordingly. Following this the horizontal marks on each original pulley can be transferred by laying the original pulley over the new vernier and aligning the appropriate dowel slot on the old pulley with the dowel slot on the new one, the picture below shows the alignment markings transferred onto the verniers from the original sprockets with the verniers aligned how they should be for fitment to the engine when the engine is at 90 degrees BTDC (before top dead centre). 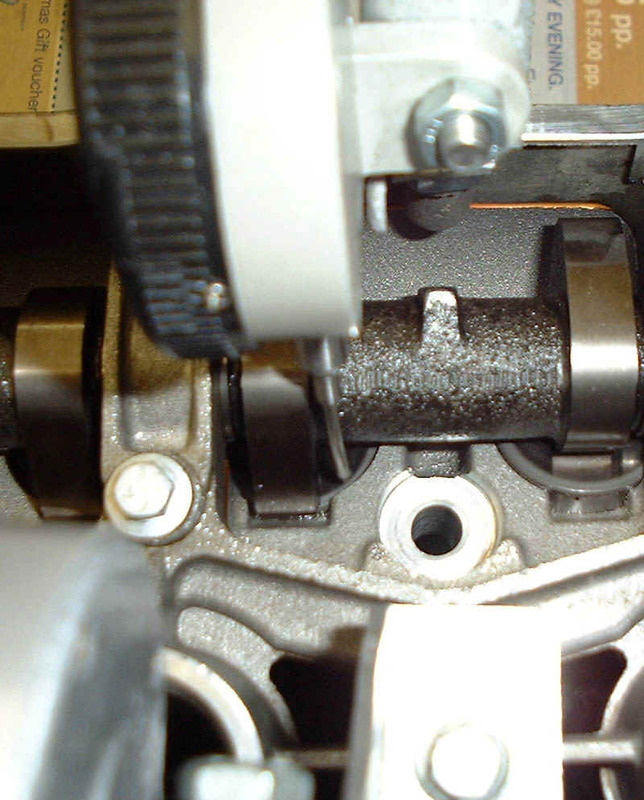 Note the arrows on the original sprockets which are marked as 'exhaust' are represented by a second scribed line on the verniers forming a simple arrowhead. Before fitting it is wise to advance the exhaust vernier by 10 degrees and retard the inlet vernier by 10 degrees, this lowers the lift at TDC and therefore makes the cam timing very safe prior to fitment and final setting. By far the best way of establishing the correct cam timing is to measure and set the valve lift at Top Dead Centre on the non firing stroke. The lift at TDC for each of the cams in the Piper range is given on the Piper page, note that this may be different for the inlet and exhaust cams of a pair. 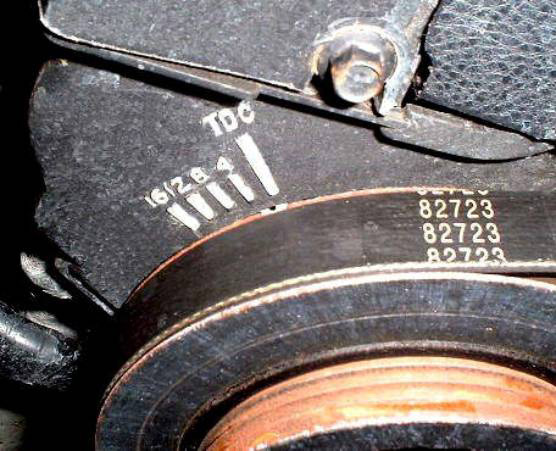 Once your verniers are fitted it is necessary to establish TDC for cylinders 1 and 4 on the engine, this is actually marked with a small embossed pattern on the front timing cover and a corresponding small notch on the back face of the pulley, it is probably a good idea to mark the embossed line for TDC (this will be the last line on the right in a group of 4 lines on the cambelt cover) and the notch on the back of the pulley with a small dab of white paint or similar to make it easy to spot. 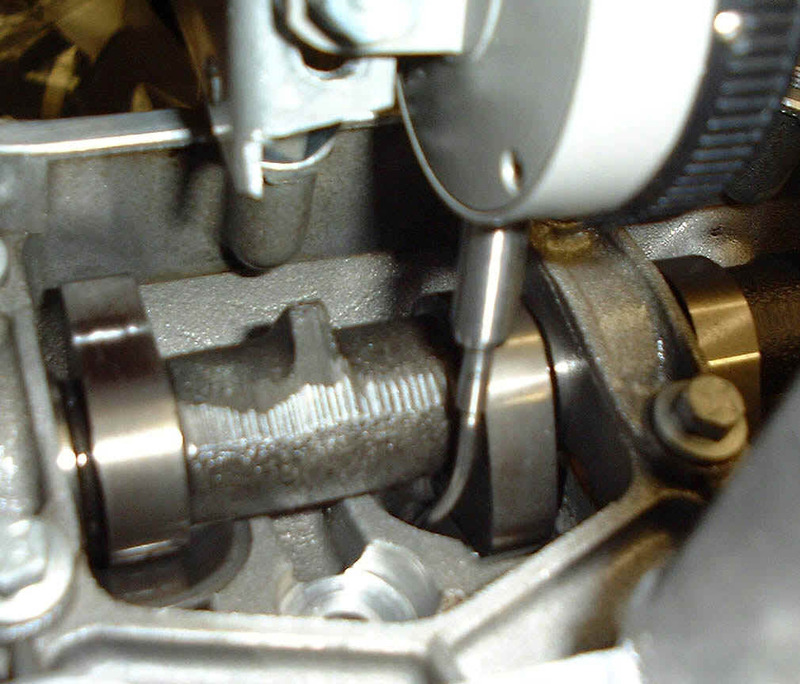 The picture below shows the timing marks with the crank aligned at TDC. This will get you close to actual TDC, the use of a dial gauge with suitable extension should be used to exactly pinpoint TDC. To establish the correct cam timing you will need the equipment described in the second half of this document, at least a pair of dial gauges, an allen key of the correct size for your pullies and a 17mm socket and bar, or 17mm ring spanner. v) Take your dial gauge and clamp it so that the point of the gauge is resting on the cam follower of one of the inlet valves for the selected cylinder and is perpendicular to the surface of the follower, it the tip isnt long enough, use a small piece of TIG wire or similar to extend it,set the dial gauge scale to zero. vi) Turn the engine anti-clockwise slowly until the needle on the dial gauge no longer moves. This indicates that the valve is shut, note while doing this how much the needle moves, this value is the current lift at TDC, turn the engine back to TDC and note the movement in the needle to confirm. vii) If this is not the desired value, slacken the clamp bolts on the vernier and then using a long extension bar and a 17mm socket turn the cam using the centre sprocket bolt to change the lift, if you want more lift, turn the cam sprocket bolt clockwise (so that the vernier needle moves towards the 'advance' side), if you want less lift turn the cam sprocket bolt anti-clockwise (towards the 'retard' side). While doing this note the change in lift until it reaches the desired figure, then tighten the clamp bolts on the vernier. x) Attach the dial gauge so that the the tip is resting on a cam follower for one of the exhaust valves in a similar manner as descirbed in section v, set the gauge scale to zero. xi) Turn the engine clockwise until the needle on the gauge no longer moves which indicates that the valve is shut, note while doing this how much the needle moves, this value is the current lift at TDC, turn the engine back to TDC and note the movement in the needle to confirm. xii) If this is not the desired value, slacken the clamp bolts on the vernier and then using a long extension bar and a 17mm socket turn the cam using the centre sprocket bolt to change the lift, if you want more lift, turn the cam sprocket bolt anti-clockwise (so that the vernier needle moves towards the 'retard' side), if you want less lift turn the cam sprocket bolt clockwise (towards the 'advance' side). While doing this note the change in lift until it reaches the desired figure, then tighten the clamp bolts on the vernier. It's easier to do than to type and its intuitive too. 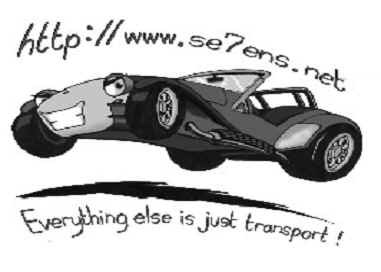 This part of the document describes the equipment necessary to correctly set the cam timing on the Rover K series engine. 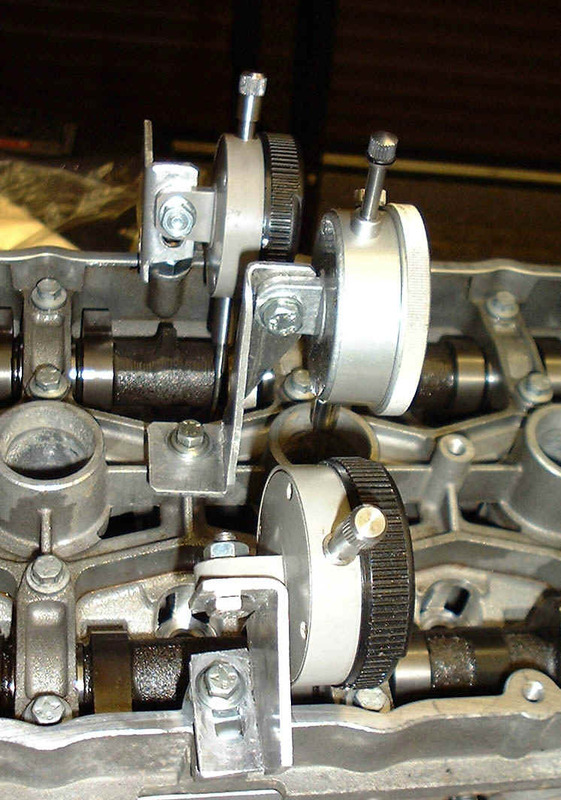 The bracketry shown can also be used on many other DOHC engines with 20-22 degree valve angles and has been designed to allow use on K16 and also VVC engines (these have a taller cam ladder). 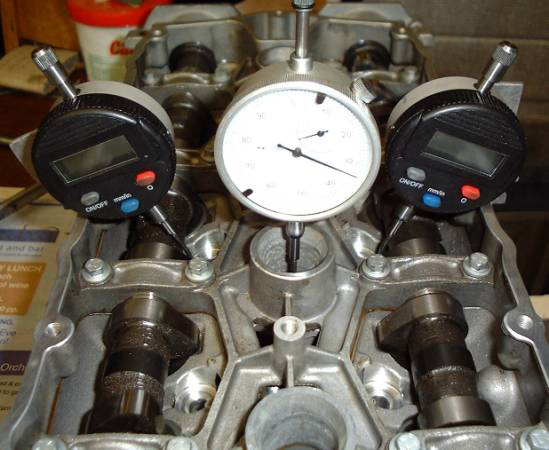 The primary considerations aretwo dial gauges and some bracketry to fix them to the top of the cylinder head where they can accurately establish Top Dead Centre on any cylinder and also give a reading of lift at TDC. The brackets are best made from 2mm or 2.5mm aluminium. The best type of gauge used to establish TDC is an analogue one with a radial scale and rotating needle hand or pointer. This is because at the point of TDC it is easy to spot when the needle stops moving and then starts to reverse its motion, the dwell point at TDC is then easy to determine. 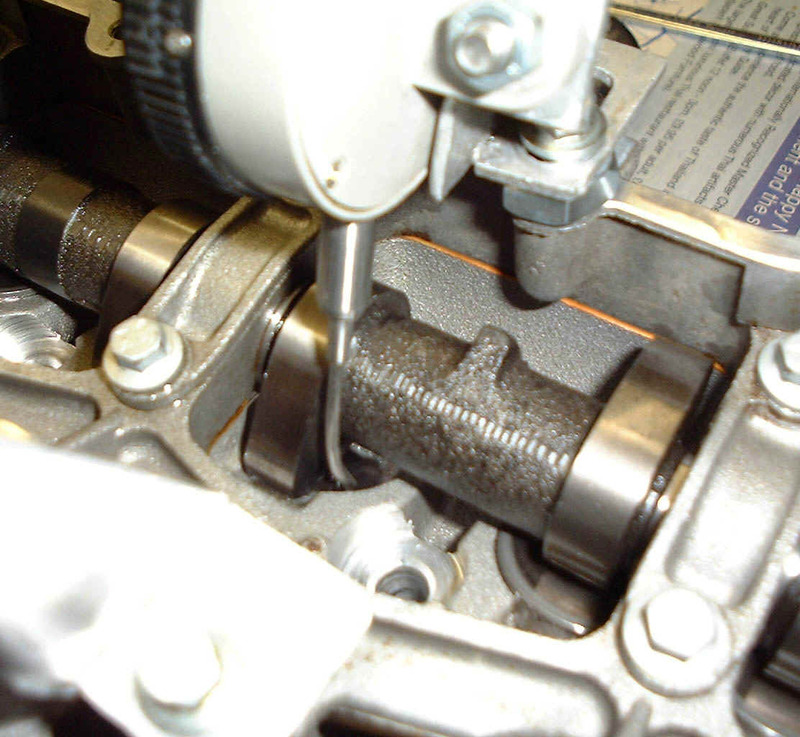 A simple bracket is used to mount the analogue gauge above a plug hole using one of the cam cover bolt holes as a mount. 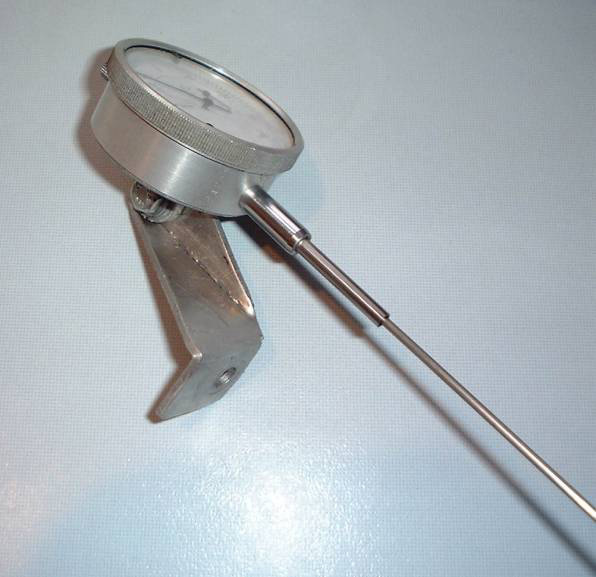 The probe on the analogue gauge should be unscrewed and replaced with a piece of stainless TIG wire which has been tapered to allow it to screw hard up into the gauges threaded shaft. The wire must extend the gauge probe to 172mm from the base of the mounting bracket, this ensures that the probe will be long enough to reach the piston on both K16 and VVC engines. The design for the mounting bracket is shown below together with a couple of pictures of the gauge and bracket as assembled. A cheap but accurate dial gauge can be bought for around £10 from J & L Industrial supply. Make sure that the one you buy has a mounting lug on the rear of the casement. The best type of gauge to measure the lift on the valve is a digital type that can be zeroed and then give an accurate absolute measurement of lift, radial analogue gauges are far more difficult to read when measuring and adjusting absolute lift. 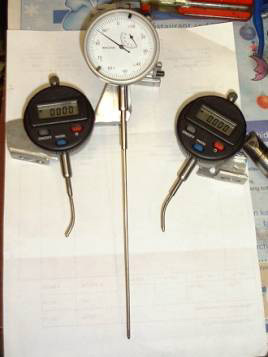 Although digital gauges are more expensive (around £50 from J & L) they will save time and aid accuracy. A simple bracket is used to mount the gauge above the follower at the same angle as the valve and follower so that it traces and measures lift accurately. When mounted the gauge’s proximity to the cam requires that the probe at the tip be bent in such a way as to clear the core of the cam and rest on the top of the follower. The tip of the probe is again unscrewed from the gauge and replaced with some suitable TIG wire that has been tapered and screwed into the gauge shaft. This wire is bent as shown in the photo to clear the cam core. The distance from the base of the mounting to the tip of the probe measured vertically should be approximately 56mm. 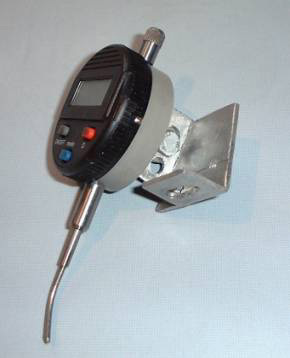 I use two of the brackets that are mirror images of one another and two digital gauges but it is possible to use a single bracket and gauge and re-mount the gauge appropriately for each side. The slots in the brackets ensure that the gauge(s) can be mounted with sufficient movement in either direction to measure the valve lift and so that they may be used on K16 and VVC heads. The bracket(s) are mounted on the top of the head using one of the cam cover bolt holes, the gauge probe is set to touch the top of the rearmost cam follower for any cylinder just alongside the cam lobe as shown in the photos. 1369/VVC exhaust/TF135/PTP140 252 9.32 .030" .025" .035" .030"
BP270 (new) 260 9.65 .040" .030" .050" .040"
633 264 10 .045" .035" .060" .055"
1320 268 10.6 .045" .035" .070" .060"
Caterham SS .060" .045-.050" .080" .060-.065"
BP285H 274 11 .110" .095"
BP285M (740) 276 11.2 .120" .100"
VHPD (827) 280 10.2 .130" .115"
1227 280 11.2 .140" .125"
1444 278 12 .140" .125"
2180/1444 290 12.4 .160" .130"